DARMSTADT, Germany — Before ending operations, Rosetta stared down her final resting place. The European Space Agency (ESA) released the last images that its Rosetta spacecraft captured before making a death dive into Comet 67P/Churyumov-Gerasimenko Friday (Sept. 30). The view is slightly blurry — Sierks said his team still has to sharpen the images — but the gravelly surface of the comet is clearly visible. The scale of the image is about 5 mm/pixel (0.2 inches/pixel), and it measures about 7.6 feet (2.4 m) across, according to ESA. 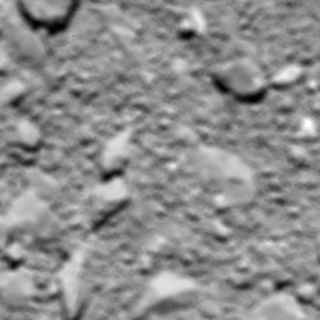 Rosetta’s OSIRIS narrow-angle camera captured this image of Comet 67P/Churyumov-Gerasimenko at 0120 GMT from an altitude of about 16 km above the surface during the spacecraft’s final descent on Sept. 30, 2016. The image scale is about 30 cm/pixel and the image measures about 614 meters across. Rosetta, which had been orbiting Comet 67P for the last two years, was not designed to survive a landing. But when it came time for the 12-year mission to end, ESA officials decided to send the probe on a collision course with the comet so the spacecraft could collect some last-minute, up-close data on this icy cosmic body. The landing site was a region called Ma'at on the smaller of the comet's two lobes, sometimes called the "head" because the comet is shaped like a rubber duck. This region was chosen because it has several active pits, some over 330 feet (100 m) wide, where the comet's jets of gas and dust emerge. Mission managers said they had been hoping Rosetta could peer inside one of the pits dubbed Deir el-Medina. The walls of these pits also have "goose bumps" that scientists said they wanted to study in greater detail, because these lumps could represent the comet's internal building blocks. Rosetta’s OSIRIS camera captured this image of Comet 67P at 0818 GMT from an altitude of about 5.8 km during the spacecraft’s final descent on Sept. 30, 2016. The image scale is about 11 cm/pixel and the image measures about 225 meters across. "They give us clues about the origin of cometary nuclei," said Sierks. The images haven't been fully analyzed yet, but Sierks said already it seems like the views inside the pit show some of the details the scientists are after. Follow Megan Gannon @meganigannon, or Space.com @Spacedotcom. We're also on Facebookand Google+. Originally published on Space.com.